Last Friday the Library of Congress website published an article called 'Belarus: Browsing Foreign Websites a Misdemeanor'. The story authored by Peter Roudik raised a huge wave of attention first in the blogosphere and then in the mainstream media. The titles were truly sensational. 'Belarus Breaks the Internet, Raises the Digital Iron Curtain' wrote Forbes yesterday. 'Belarus Makes it a Crime to Visit Foreign Websites' was another title. Even the BBC repeated the story. According to these media outlets Belarusians will soon be prohibited from visiting foreign websites and will face fines if they fail to obey. They also wrote about an introduction of new fines for visiting websites blacklisted by the government. Radio Free Europe, also published an article Belarus Restricts Use of Foreign Web Sites but then promptly removed it. They probably did so for a good reason. The original Library of Congress story authored by a Moscow-born and -educated lawyer looked sensational because it twisted a number of facts. The speed with which the misleading story filled the mainstream media without being properly checked was truly remarkable. So what is the new Belarusian law about? Although this law as many other Belarusian laws is ambiguous in some respects, it is absolutely clear that it does not target regular internet users in Belarus. Instead, the newly amended Article 22.16 of the Code on Administrative Offenses applies only to internet businesses registered in Belarus. It is obvious for lawyers that the Administrative Code is not making any activities a crime, because it is not a Criminal Code. Essentially the Administrative Code requires that businesses registered in Belarus which sell goods or render services using the internet physically locate their networks and computer systems inside Belarus or register them in Belarus. Failure to do so may result in an administrative fine. Once again – this rule only targets internet businesses. That means that 'non-commercial' internet users such as bloggers, journalists, and social networks activists are not going to be affected by it. Moreover, this rule is not actually new. The provision which limits Belarusian businesses' ability to use foreign-based hardware to sell goods or render services in Belarus has been in effect since July 2010. The new amendments which will become effective this month merely add a fine for failure to comply with this rule. It appears that the main motivation behind the rule is to combat tax evasion which was very common amongst Belarusian internet stores until recently. Because credit cards are not widely used in the country, most goods on Belarusian Internet shops are sold for cash and it was difficult for authorities to track those purchases and collect taxes. Although the effectiveness of this rather Draconian method to combat tax evasion is questionable, it was certainly not directed against dissidents. Both stories fail to mention an important detail – these restrictions can be introduced only in state bodies, public organizations, as well as educational and cultural establishments. Again only internet providers can be liable under this law if they fail to limit access to 'harmful' web sites in state organizations, libraries, etc. In other words, fines can be imposed against internet service providers but not Internet users. Needless to say, there are no fines for accessing blacklisted web sites. In practice, most Internet users in Belarus face no browsing restrictions. Non-government and opposition-leaning websites are much more popular in Belarus than those controlled by the state. Moreover, according to the International Telecommunication Union, Belarus has 46% internet penetration which is higher than in Ukraine (33.9%) or Russia (43%). Most Belarusians face no restrictions on accessing either foreign or domestic websites. Of course, the situation with freedom of speech and internet is not as good as in democratic countries. Many state organizations block access not only to pornographic websites, but also to certain opposition websites which they deem harmful. As with the previous myth about the prohibition of browsing foreign websites, these restrictions are not new. The authorities have been doing it for years and nothing significant has happened on this front recently. Although internet users may be prevented from accessing blacklisted websites from their work computers, they can easily do so at home. Another problem in Belarus is that opposition websites often face suspicious attacks. They occur not only around election times or during the recently attempted social networks revolution but also in 'peaceful' times. For instance, last week the popular political website charter97 was temporarily disabled by a cyber attack. The authorities are also known to intercept Skype conversations and internet correspondence of opposition activists. Although the Belarusian security services do not have unlimited technical capabilities to monitor everybody, they are certainly not constrained by Belarusian laws or human rights concerns. At the same time, the situation regarding internet freedom in Belarus appears to be better than in many other post-Soviet States. For example, since August 2011 Kazakhstan has completely blocked access to Livejournal – the most popular blogging platform in the country. 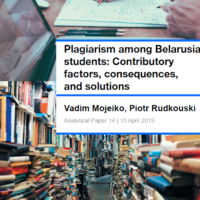 The story about browsing foreign websites in Belarus shows that Western journalists often prefer to rely on secondary sources and translations rather than original materials. Although Mr Rounik of the Library of Congress was able to read the original legal text published in Russian, the title of his article was misleading and it twisted a few facts as explained above. Not only did the story distort the language of the law, it kept using the Soviet-era word 'Belorussians' to refer to residents of Belarus. Any spell-checker knows that since 1991, the country's residents are called 'Belarusians' in English. It is understandable that even the largest library in the world can make mistakes. What is more surprising is that reputable media such as the BBC apparently preferred not to double check the original law or read Belarusian lawyers' comments such as those recently published by the independent Belarusian Journalists Association. Instead, they decided to quickly publish a sensational story to attract more readers. There is no doubt that the poor international reputation of Belarus, dubbed 'the last dictatorship in Europe' by George W. Bush, contributed to this wave of misinformation. The country's reputation provides a fertile ground for all kinds of myths and speculations. Getting the facts right is more than an issue of journalistic ethics. It is also an important precondition to influence what is going on in Belarus. The year of 2011 was in many respects a unique year for Belarus. Unlike a regular year, it started not on 1 January but rather on 19 December of the previous year. 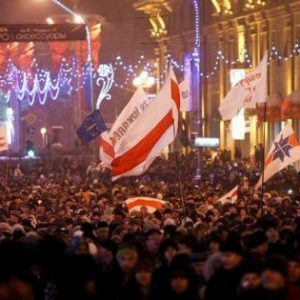 On that day the presidential election took place and in the evening a huge crowd of protesters gathered in the center of Minsk. The police violently dispersed the crowd. Hundreds of the protesters were arrested, including 7 presidential candidates. Numerous hopes for a more democratic future crashed instantly. As a result, all the major events and trends of 2011 in Belarus were in this or another way affected by the crackdown and its repercussions. The most evident repercussions of 19 December reflected in foreign policy. After two years of a thaw in the relations with the European Union the 2011 signified a partial isolation of Belarus by the EU. Targeted sanctions against certain individuals and economic entities were introduced and expanded throughout the year. But it was only a partial isolation – Belarus remained in the Eastern Partnership and some official and informal political communication continued. Moreover, mutual trade (in particular, Belarusian exports) demonstrated an impressive growth. According to the Belarusian Statistics Agency, the export of Belarusian goods to the EU in January-October 2011 grew by 121,7% (compare: the exports to Russia grew by 41,2%). However, even the partial isolation from the EU lead to a significant reduction of the space for geopolitical maneuvering. The Belarusian authorities became more exposed to pressure from Russia. Dependence on Russian credits, investments and subsidies grew considerably. As a result, Belarus had to fully implement its integration commitments given to the Kremlin, which in many respects endangered the country’s interests. For example, a recently leaked government document shows that the authorities did not even have enough time to analyze the future implications of Russia’s accession to the WTO for the Belarusian economy before they had to sign the documents on the Single Economic Space. They were simply rushed into it by Moscow. The economic crisis that hit the country in 2011 was not directly caused by the crackdown on 19 December. It was an inevitable outcome of multiple macroeconomic imbalances that the government had ignored for several years. However, 19 December made a less painful transformation of the model impossible. It deprived Belarus of potential western investments which could have softened the currency shocks and facilitated some degree of economic modernization. Western investments would have also counterbalanced Russian investments and, thus, safeguarded the interests of the Belarusian elites and society at large. But after the government resorted to repressive actions against its political opponents several international financial institutions (including the European Bank for Reconstruction and Development and European Investment Bank) decided to suspend their programs in Belarus. This was interpreted by potential western investors as an additional sign that the country was not safe to work in. As a result, instead of USD 6.5 billion of foreign direct investments (FDIs) planned for 2011 Belarus received less than USD 800 million of FDIs in its real economy (the Beltransgaz deal can hardly be considered an FDI). Before 19 December 2010 and the economic crisis of 2011 the Belarusian ‘power vertical’ was widely seen as super efficient. The majority of experts argued that the political model was capable of producing any governance result wanted by the president. Therefore, they would say, there should be no problem with, for example, carrying out market and political reforms once a decision is made by Alyaksandr Lukashenka. Now it looks like this theory was wrong. The financial turbulence of 2011 clearly showed that the ‘power vertical’ in Belarus ceases to be efficient as soon as it faces untypical challenges. Under unaccustomed circumstances it fails to perform even relatively easy tasks. Like, for instance, privatization. In order to help the troubled state finances the government worked out a privatization plan for 2011. But the ‘power vertical’ only managed to sell 13% of the planned assets. While the reasons for this failure are multiple, one is particularly interesting. According to the Chairman of the State Property Committee Georgi Kuznetsov, the privatization was sabotaged by local bureaucrats and managers of state enterprises. In other words, like on 19 December 2010, some parts of the ‘power vertical’ undermined the government’s policy and worked against the government’s interests. And, as the emergence of cracks in the government demonstrated, the more difficult challenges get the less potent the Belarusian ‘power vertical’ becomes. On the background of the repercussions of 19 December and the crisis of 2011 it is not surprising that numerous surveys revealed a very alarming trend. Thousands of people left the country in search of better work and life standards. Even more sadly, according to several polls, between 60 and 80 per cent of the youth are eager to emigrate once they have a chance. And today it is really difficult to find even a most radical babushka-supporter of Alyaksandr Lukashenka who will not be happy for her grandchildren to leave Belarus for a better place. Thus, Belarusian society is unanimous in its pessimism about the future of the country and opportunities that one can have in it. This is, perhaps, the most telling result of the outgoing year and the best characteristic of the accomplishments of the incumbent regime. Unfortunately, it looks like the legacy of 19 December will continue to stay with us and will become lingering. It means that there might be many more unpleasant developments waiting for the people of Belarus. And we can only hope that the New Year will introduce a bit more of optimism in the lives of the Belarusians.